Although gold typically gets the most attention, other precious metals such as platinum and silver can also be a sound investment. No matter if your goal is to put in a hedge against future inflation or you are aiming to diversify your portfolio, a silver ETF can be an excellent choice. An ETF is similar to a mutual fund, but unlike a mutual fund, an ETF can be bought and sold throughout the trading day, exactly like how a stock is traded. While you always have the option of investing in physical silver and other precious metals, there can be additional hassles when choosing this route. The storage and safe keeping of physical silver is one of these hassles, and can prove to be a challenge for many silver investors. In any case, silver ETFs are an efficient way to invest in the metal without dealing with the associated “headaches” of holding a physical amount of silver in your possession. This makes an ETF the perfect vehicle for volatile commodities and metals. Silver ETFs are ideal for investors and traders looking to speculate on the price of silver in the short, medium or long term. 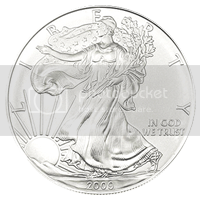 Silver ETFs can either directly hold silver bullion, or invest in derivatives that track the price of silver. Both types of ETFs will move with the price of silver, and similar types of silver ETFs usually have similar expense ratios. Many of the precious metal ETFs track the underlying metal with a great degree of accuracy. As well as silver exchange traded funds, there are many other precious metal ETFs including gold ETFs and palladium ETFs. Many of the precious metal ETFs are very closely correlated as the underlying metals prices tend to move closely together. Investing in metal exchange traded funds takes out the hassle of buying the physical metal in the form of coins of bullion bars. Both the insurance and/or storage costs can be significantly higher than the cost of investing in an exchange traded fund. When buying bars and coins privately, there is often a big spread between the buy and sell rate, making the cost of the transaction very high. The management fees of precious metal ETFs varies from 0.2% to around 2%. How does a silver ETF work? The fund manager of a silver exchange traded fund has two options to track the price of silver. The first option is to buy and store the physical metal. A big fund manager won’t have the same costs to do this as an individual due to the volume. The second option is to use the futures market. Futures contracts are traded on margin and follow the price of the metal accurately. However, due to futures being traded on margin, the risk-free cash rate is usually priced into the contracts. What other ways can you invest in precious metals? As well as investing in precious metal ETFs, buying and storing the metal and the futures market, the other option is to buy stocks in the mining companies. Whilst many mining stocks do have a great deal of correlation to the underlying price of metals, there are many other factors that are likely to influence the price of individual stocks, so the stock price of these companies isn’t likely to track silver and other metals as closely as an ETF. Where can I buy Silver ETFs? Gold, Silver and Palladium ETFs can be bought and sold just like conventional stocks through a stock brokerage firm. The cost of trading can vary greatly between different brokers. I generally suggest a discount broker, as these often have significantly lower trading fees. To find out more about discount brokers, click here.